The 2018 NFL Draft made history during it’s furious opening round with a record number of quarterbacks taken in the first 10 picks. Not to be lost in the five total quarterbacks taken on Thursday night were multiple teams trading up and down, one player’s slide down the first round and a number of highly-ranked players on PFF’s top 50 prospects still available. As the dust settles on Round 1 and the NFL world shifts focus to Rounds 2-3 on Friday night, we at Pro Football Focus outline our top eight picks that we like from a value and team fit standpoint. Check out our best available remaining prospects for more insight on those players who could hear their name called on Friday night. 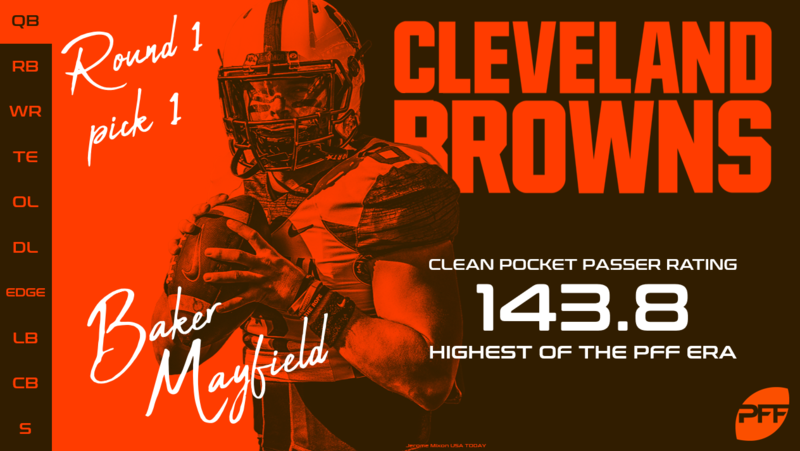 Our longstanding top player overall finally came to fruition when Mayfield was selected first overall as Mayfield earned the best grade of any quarterback since PFF started grading college production in 2014 at 95.2 last season. Using the actual ball location of each pass to determine accuracy, Mayfield was the most accurate quarterback in the class with an accuracy rate of 48.5 percent (passes that are in a perfect location or on the receiver’s frame). The narrative that Mayfield benefitted from a great offensive scheme is true, but that doesn’t mean he didn’t perform at the highest level when asked to make throws that are important at the NFL level. Using our “NFL Throws” metric that bucket’s the common throw throw types into either “NFL Throws” (passes that separate quarterback performance and value such as a horizontal lead throw at or past the sticks into tight coverage) or “non-NFL Throws” (the expected throws that most NFL quarterbacks make on a consistent basis, think screen or an open throw well short of the sticks), Mayfield was the highest graded quarterback on “NFL Throws” and the only quarterback to eclipse a 50.0 percent accuracy percentage on those throws. As we stated before, his tape and numbers said he should go No. 1, and now he has. The Browns made the shrewd choice to value what a player has done and can do in football games and for that all of Cleveland should be thankful. Darnold fell into the laps of the New York Jets at No. 3 overall, after the New York Giants selected Saquon Barkley at No. 2. Despite a rough stretch in the middle of the season, Darnold was the third-highest graded quarterback across every other week (taking out Weeks 4-7). 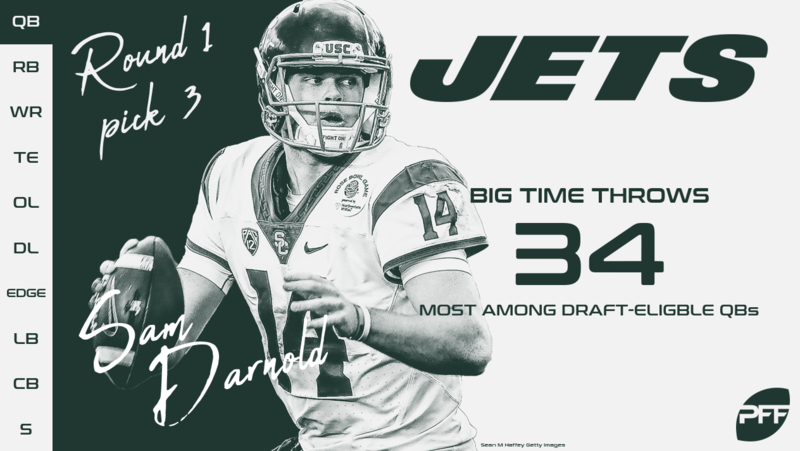 Even with that, the Jets add a quarterback in Darnold who led the nation in big-time throws, throwing 34 of our highest-graded throws a season ago. He capped a brief, two-year career of playing experience at USC with the majority of his positively graded throws coming across the middle of the field, an area where he generated a 108.1 NFL passer rating. All told, Darnold’s top-end passes are among some of the most impressive in the class, and he’s extremely clutch, as our Steve Palazzolo outlined earlier this offseason. 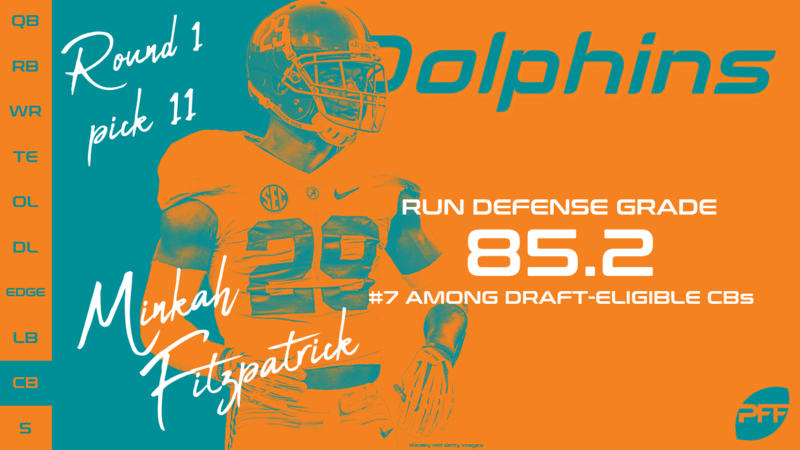 The rare highly-regarded, predominantly-slot player coming out of college, Fitzpatrick begins the rebuilding process for the Dolphins by immediately plugging in at what is a very valuable position in today’s NFL for what was the third-lowest-rated pass defense in the league. While his coverage numbers dipped a bit in 2017, he did enough things well in each game to have just one (slightly) negatively-graded game the entire season, while finishing his career allowing only a 66.5 passer rating into coverage. To top it off, he led all college cornerbacks in pressure generated, which is an added value to a defense that will need it moving forward. The versatile James was an absolute gift to what could be the league’s best defense in 2018. He offers substantial value as a coverage player (he allowed just a 58.1 passer rating into his coverage while at Florida State) and as a blitzer (he generated 38 total pressures during that time). 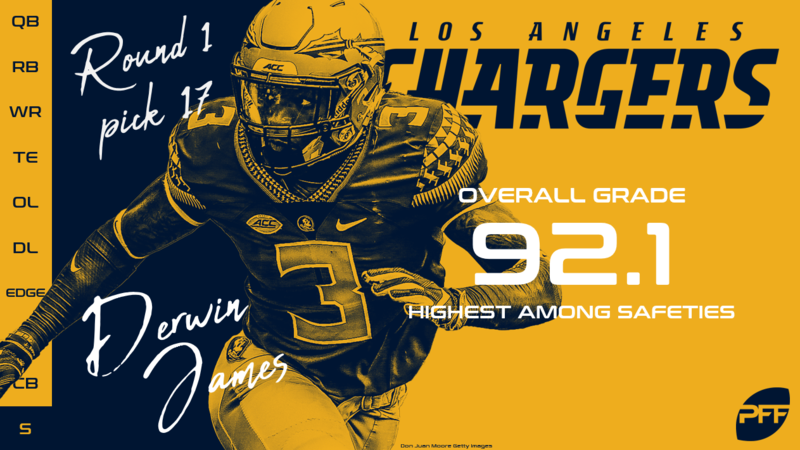 With Casey Hayward, Jason Verrett, Desmond King and Jaleel Addae as holdovers for what was already the highest-rated pass defense in the league, James won’t be asked to do too much too early, raising the floor on a pick that already has a substantial ceiling for them at Pick 17. 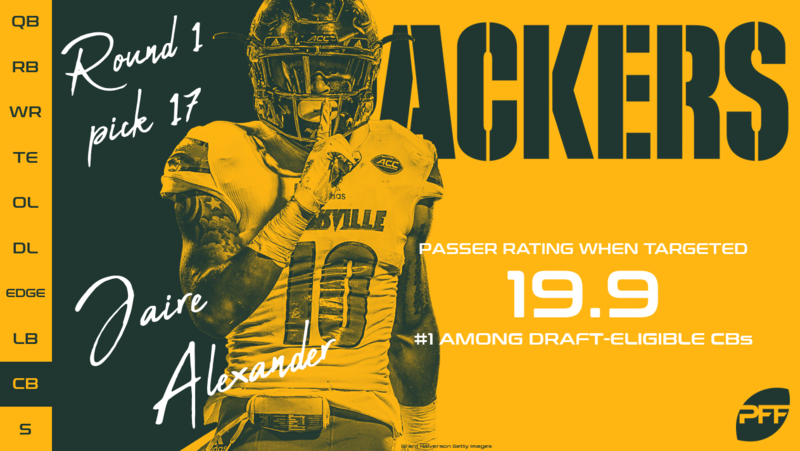 Green Bay addresses a substantial need here with Alexander, and did so via trading back, and then up – accumulating a 2019 first-rounder in the process. While the majority of his snaps the last two years were on the outside, he projects as a player that can play on the inside of the Packers defense if needed. Though he missed much of 2017, he allowed less than a 20.0 passer rating into his coverage on the year, and less than a 55.0 passer rating throughout his college career. He figures to compete with 2017 draft pick Kevin King (41.0) and longtime Packer Tramon Williams (88.8) in a Green Bay secondary that finished in the bottom third in the league in our rating system. 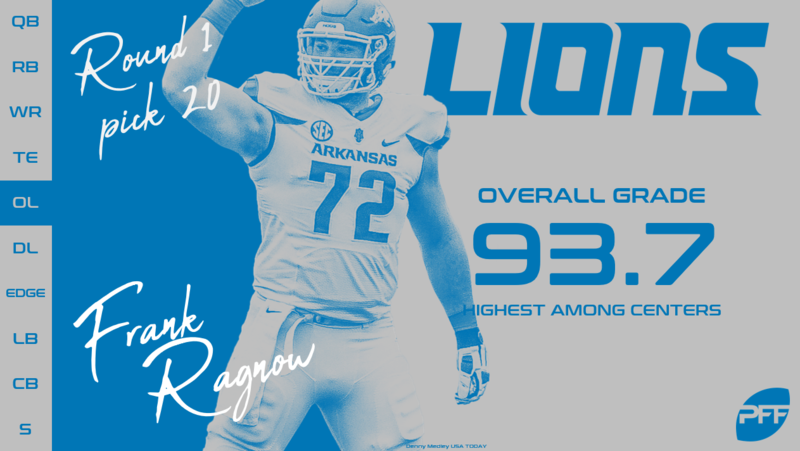 Our top-graded center in each of the past two seasons, Ragnow joins a Lions team in desperate need both a run-blocker and a pass-protector on the interior of their offensive line. Detroit finished last season with the 20th-ranked pass-blocking unit and the 17th-ranked run-blocking group. Ragnow consistently graded extremely well in run-blocking, including last season in which he ranked first among draft-eligible centers in run-blocking success percentage (94.6 percent). Rounding out his skillset on the interior, Ragnow also did not allow a sack across 1,242 snaps in pass protection during his four years at Arkansas and allowed only a total of 35 total QB pressures in four seasons. 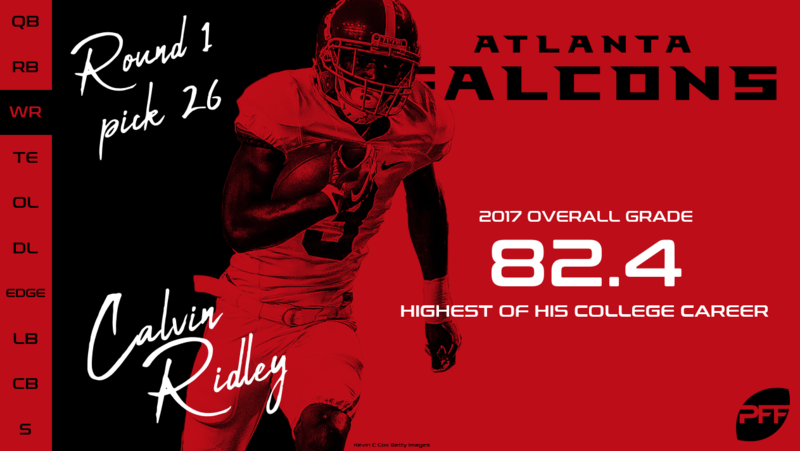 Ridley appears to be a great fit and value for a Falcons team that was never able to recoup the production from 2016 Taylor Gabriel. Ridley brings 4.4 speed, as well as great route running ability that allows him to create a lot of open throws. This is good news for Matt Ryan, he threw to a below average of “open” targets (41 percent vs league average of 43 percent). Ridley provides versatility having run about 20 percent of his routes from the slot in his career and seeing 16 percent of his targets on screen passes while also averaging 45.1 yards per catch on deep passes (seventh in the class). There are certainly concerns with Ridley, he is 23 years old and ranked 111th in drop rate (7.2 percent) and while drop rate is a fairly unstable metric at the NFL level it is certainly still a bit worrisome. Overall at Pick 26, getting a player who can help reboot the potent Falcons offense to 2016 levels is one of the better picks in the first round. The capital it took to secure this pick in a trade from the Eagles notwithstanding, being able to pick a quarterback of Jackson’s caliber at No. 32 is excellent value. Jackson ran for 8.7 yards per rush in college with 73.0 percent of his rushing yards coming on designed runs. The ability to create passing-like yardage with his feet is of tremendous value. Jackson was not the most accurate passer in this draft ranking 10th of the 10 draft class quarterbacks that we charted ball location for this past season. That being said he made the fourth-highest percentage of perfectly accurate throws and his biggest struggles were on passes behind the line of scrimmage where his accuracy percentage was 20.0 percent below the class average. Jackson was much more of a pocket passer than common perception would lead you to believe, in fact he threw to his second look more frequently than any other passer in the draft. When he did, he had an above average accuracy rate (55.0 percent vs 51.8 percent average) while also limiting turnover-worthy throws (2.27 percent vs 6.83). 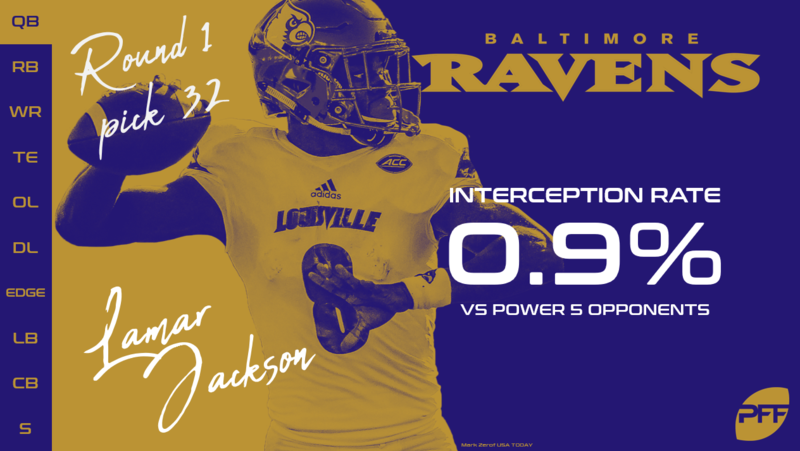 Jackson brings the ability to provide value in many ways on each play and the Ravens will now be tasked with constructing the offensive scheme to maximize that.